Today is Baptism of the Lord Sunday, a day when we celebrate both the person and the purpose of Jesus Christ at the beginning of his ministry. But today we are not in the Colonial Heights Presbyterian Church sanctuary—hopefully, we are safe and warm for a Sabbath day at home as we wait for snow to melt outside our windows! This a prayer service for us to read from home today. Separated from one another in body, we remember the one Lord, the one Holy Spirit, and the one baptism that unites us in spirit today. Though this doesn’t replace the experience of worshiping together, it invites us to reflect individually on the scriptures for the day and the meaning of baptism, for Jesus’ ministry and for us today. God of new life, your voice thunders above the sound of loud waters. You sit enthroned above the floods of life. As Jesus heard you speak to him in his baptism, may we also hear you calling us your beloved, through Jesus Christ, your son, our brother, Amen. God makes Lebanon skip like a calf, and Sirion like a young wild ox. 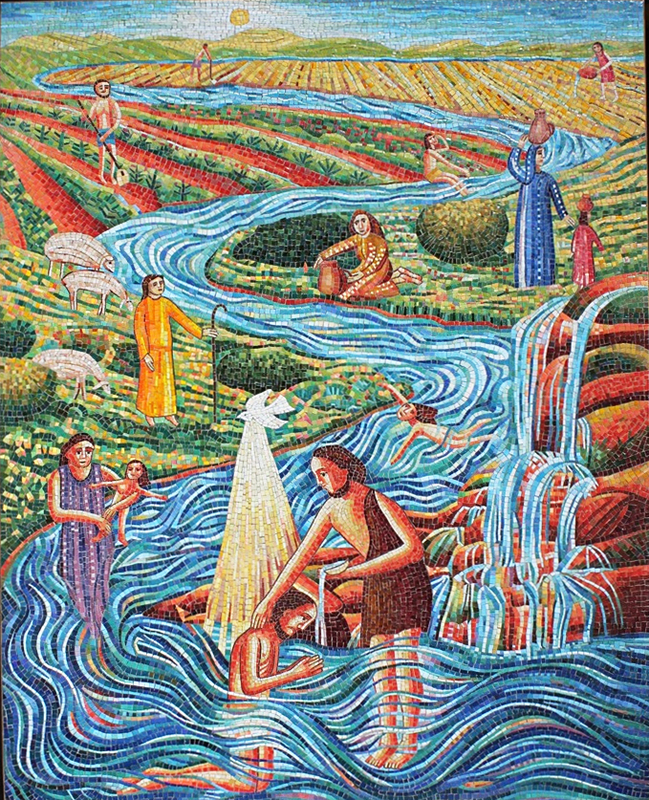 The story of Jesus’ baptism in the Jordan River marks the beginning of his ministry. In Jesus’ baptism, God names him as God’s Son, the Beloved. This is a name that gives him an identity and a purpose. He belongs to God. He is beloved by God. He is also commissioned to be God’s Son in his life and ministry. He is ordained for service, and his life’s work is begun in water and the Spirit. Today baptism can easily become nothing more than a rite of passage, an event that happens and is over. But baptism is a powerful recognition that our whole lives will be shaped by water and the Spirit. Each morning we are named again as God’s very own beloved ones. Each day we are called again to live into our baptismal ordination as disciples of Jesus Christ. Baptism is just the beginning. May we remember this beginning again and again as it continues to shape our lives of faith here and now! 1. Do you remember your baptism? If so, what was most memorable about it? If not, what does it mean for you to remember your baptism? 2. Reflect on your journey of faith. 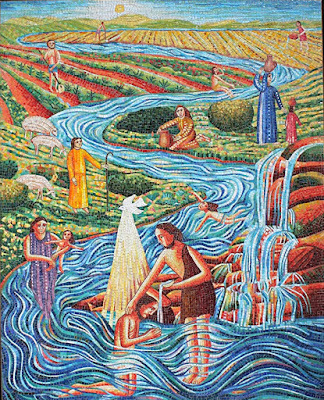 If baptism was the beginning, where are you now on the journey? Has it been a straight, winding, or circular path? Where are the places you’ve been lost and found along the way? Where has your journey led you, and where do you think it will lead next? What is your prayer to God as you continue this journey of faith? 3. The Apostles’ Creed is the baptismal creed of the Church. It unites us in faith across many Christian traditions and backgrounds. When we recite this creed, we not only profess our individual faith, but we also join with all the saints in recognizing our unity as one body in Christ. Do you remember how you learned the Apostles Creed? Who in the great cloud of witnesses has helped you to grow in faith? We fear death and doubt your promises. Though we are made of earth, we plunder it. Though we are made in your image, we abuse it in one another. to your reign of life. In Jesus Christ you pursue us, forgive us, and unite us. the hope of the ages, most faithful God. We are children of your covenant. In baptism we were buried with Christ. who raised Christ from the dead. keep our hearts and minds in Christ Jesus.